“Pianist Ken Berman's friendship with the late poet Eythan Klamka served as the inspiration for Sound Poetry, a musical project of mostly original compositions bookended by two solo reinterpretations of classic jazz standards. Poet Klamka, to whom this album is dedicated, had previously stated that "any true musician is a sound poet" and to this end, poetry and music come together on the pianists fourth album as leader. Along with electric bassist Kai Eckhardt and drummer Akira Tana, the Berman trio brave through a selection of fresh new material of light improvised nature. Billy Strayhorn's oft-recorded standard "Lush Life" opens the music with the leader on an expansive piano solo providing cleaver right-hand finger-play on a generally lush treatment of one of Strayhorn's signature tunes. Paying tribute to a couple of inspirational figures in his career, Berman pens "Old Dylan" (for "Bob Dylan") and "Bill Frisell," two original pieces the trio performs energetically. The main inspirational tune of the album is obviously, "The Poet," and while dedicated to friend Klamka, this one just happens to be one of the best charts of the album containing a slight nod to John Coltrane's "Equinox." Seemingly an instrumental ballad at first glance, "Old Style Tune" actually has a lot of kick to it featuring firm piano play, bass and drum solos that sounds like nothing old style in fact, pretty modern at that. After the short tribute-piece "Diane" (for Diane Clymer), the pianist takes off on an Allen Ginsberg read of "Mexico City Blues" with his own version titled "Spaghetti Eastern" where Eckhardt's featured bass work is only eclipsed by Berman best performance of the disc. “The confluence of Berman-Eckhardt-Tana turns out to be a very good idea. First cut starts cantabile solo piano in the expressive quasi romantically post Evans way, then the band comes in bossa nova. Eckhardt has that deep post Jaco post Swallow electric sound and the musical content of the tune is strong. They get into more of a light Rock Jazz feel and a recurring chord sequence. Eckhart plays some nicely wrought solos. Since his tenure with McLaughlin he's been playing in a funk outfit called Garage Mahal. That band creates some interesting music and he sounds well there, too, but it's nice to hear him exposed and limber in a more strictly improvisational context. Berman of course gets plenty of solo time here. He sounds good, in a full-voiced way. Steve-Kuhn-Bley-Jarrett-Evans are people he has appreciated, I suspect, and he belongs to that school here if that's what you would like to call it. It's a kind of narrative post-Bop style, with linear and harmonic movement the main thrust, as opposed to the event-cell vertical orientation of Cecil Taylor and those who follow along that path. “An original pianist with an impressionistic style, Ken Berman performs eight of his compositions on Looking Forward. Berman teams up with electric bassist Kai Eckhardt (an excellent soloist who gets a generous amount of solo space) and the subtle drummer Akira Tana. While Berman, who teaches at Berkeley and Stanford University, can be compared to other pianists who engage in close interplay with their sidemen in trios such as Richie Beirach, Keith Jarrett and of course Bill Evans, in reality he has his own chord voicings and ideas. Most of the performances on Looking Forward feature thoughtful playing and gradual development at a relatively quiet volume. This is the type of jazz that grows in interest with each listening because it is quite subtle, is full of inner heat, and its details tend to reveal themselves over time. “Piano trios are no longer what they were in the era of Bill Evans or Keith Jarrett. They're not always trying to plough through standards or set a darkly romantic mood. In fact, some of the newer trio leaders are learning to treat their pianos as percussion instruments. They're willing to sometimes let the bass and drum take reign. They're less concerned with virtuosity, or more interested in forward-motion. They'll even compose from a drummer's point of view. Ken Berman tries that approach on the title track of his new album, Looking Forward. It's arguably the most interesting composition on a record that won't suffer for lack of originality. Akira Tana provides a bustling drumbeat, working his ride cymbal for a large portion of the song. 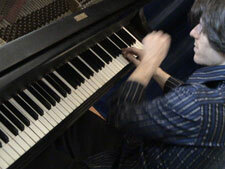 Berman plays the theme with a triplet feel. He solos with short, clipped phrases and lots of space between notes. It bumps. Known locally as both a bandleader as music teacher – he sits on the faculty of UC Berkeley's Music Department – Berman has garnered comparisons to Jarrett and Evans, probably more for his versatility than anything else. Tonally, he's funky and contemporary, more closely aligned to Vijay Ayer or Aaron Parks than straight-ahead players of the past. Even the prettier, moodier numbers on Looking Forward – ones like "Sailing to Byzantium" and "Reflections" – have a discernible pulse. Other songs, like "April Fools," are quick and tricky. "Pot Hole Road Rage" resists traditional harmony. Kai Eckhardt plays electric bass throughout, which gives the groove a sharper, contemporary edge.